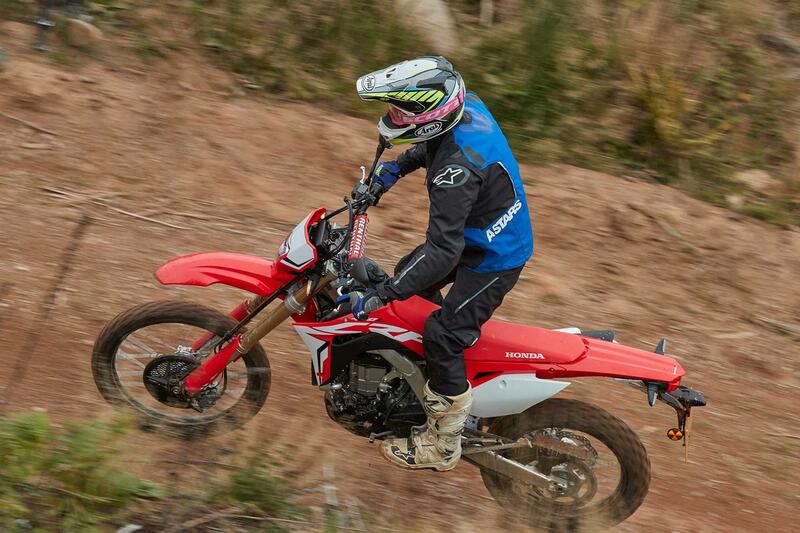 Following on from the success of the Honda CRF250L and the Honda CRF250 Rally, Honda have finally released the CRF450L. 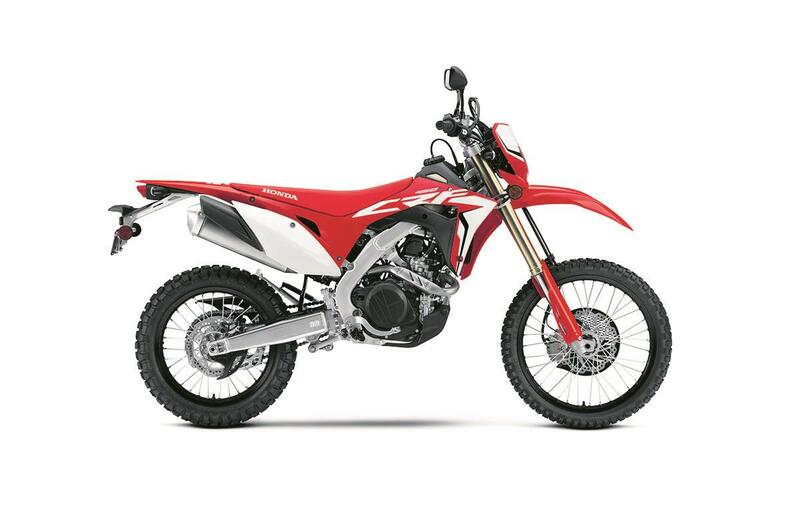 Based on Honda’s flagship motocross bike the CRF450R, the 450L has off-road pedigree running deep through its veins, but that is not where its true calling lies. Designed as a trail bike rather than a full on competition machine, it’s intended to be an off-road bike for every rider and every occasion. 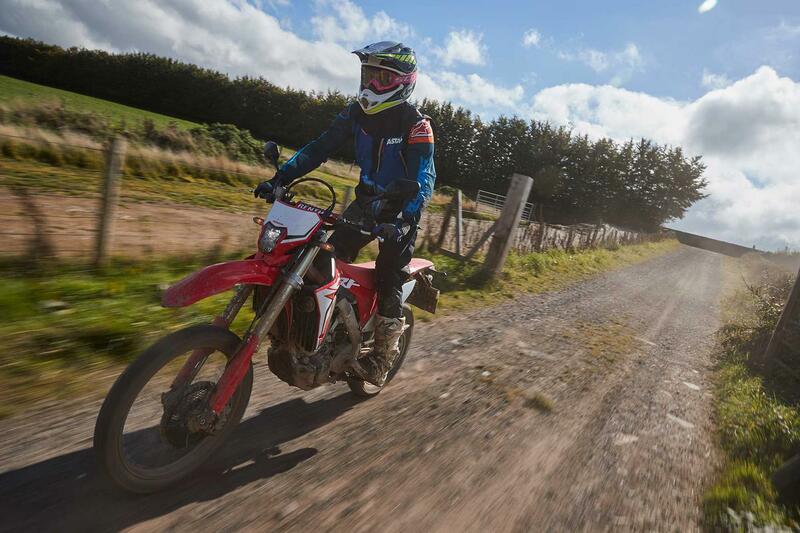 Motocross-derived enduro bikes can be a royal pain, but Honda say they’ve worked hard to ensure the CRF450L is a genuinely capable all-rounder. The six-speed gearbox, spread of torque and power, reduced compression ratio and cush-drive damped rear wheel are all aimed at the hobby enduro rider rather than those who want a ‘crosser with lights. Still, oil services come every 600 miles, and it’ll need a full rebuild at 20,000 miles. 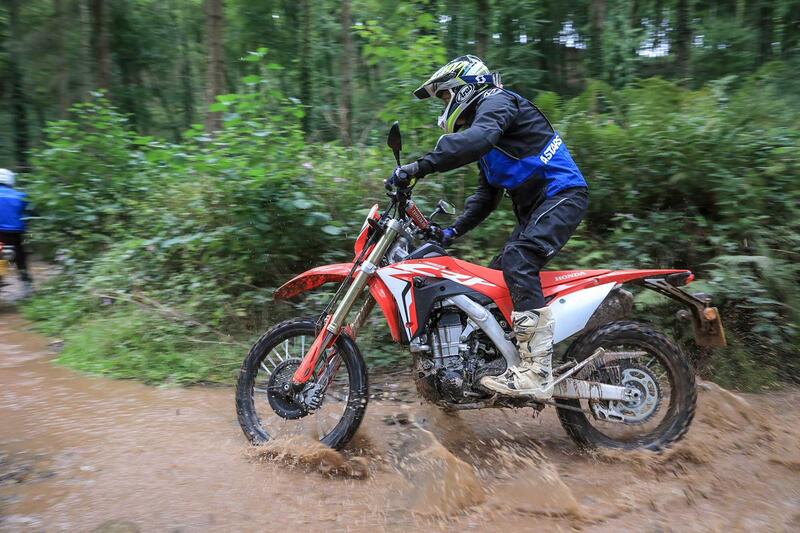 Watch MCN Sport Editor, Michael Guy, ride the new enduro and his riding impressions. Heading into the launch in 2018 and a look at the specs the expectation was for this to be a soft, lazy trail bike, but in reality it’s a lot more capable than expected, with performance nudging 450 enduro bike territory. The extra 18mm wheel base means it feels planted and stable whether blasting along fast tracks or over bumps, but little has been lost in terms of agility. Navigating through steep down hills weaving through trees was an easy and predictable experience with the bike retaining good balance. On the occasions where we got to ride it like an enduro bike rather than a trail bike, it is surprisingly capable. Yes you can feel the extra weight which makes it slightly more physical but it can be ridden at a brisk pace, with the lack of power actually contributing to the easy going and useable character of the bike. Despite the lack of outright bhp, the strong torque figure makes it an engaging and entertaining ride. It’ll burble along in first, second or third gear, but is also happy to be revved. When seeing the spec sheet of the 450L many thought that there had been a mistake on the bhp figure. Honda claim 24bhp, which is practically the same as the 250L and around 20bhp less than you would expect from a modern 450cc single. But there is no mistake, to increase service intervals and meet strict Euro4 regulations 24bhp is all you have. 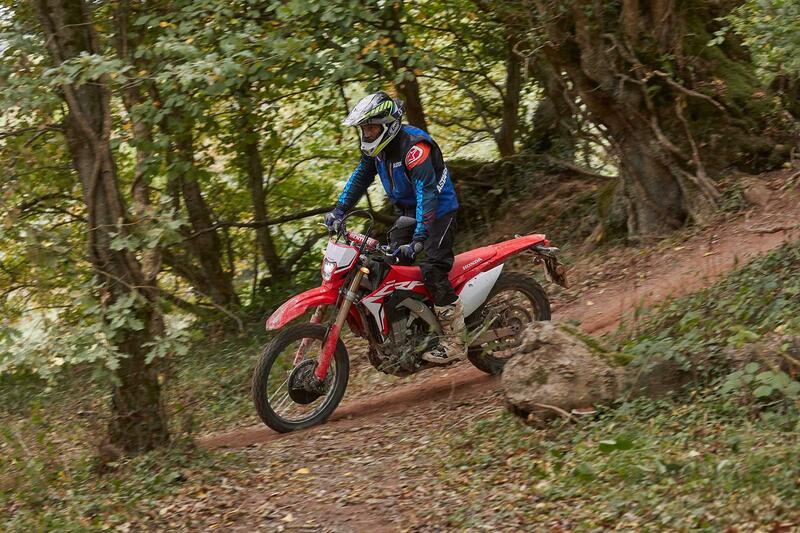 But before you lose interest and dismiss it as a non-starter, torque is a respectable 23.6ft/lb which is significantly higher than the Honda CRF250L and is key to its real world performance and living with it day-to-day. There is a heavier crank with a 13% more inertia and this along with revised fuel injection and valve timing makes for smoother – less intimidating power delivery. Compression is down to 12:1 from 13.5:1 of the MX model. It's also incredibly quiet which is a huge bonus for UK green laning. Another bonus is the six speed gear box, with 6th gear acting like an overdrive for road work giving the potential to sit comfortably at 70mph. It’s typical Honda, built to last and good quality. The LED lights offer a weight saving over traditional equipment but it still weighs in at 130kg which is significantly heavier than the MX model. Service intervals are just under 20,000 miles for a full engine strip down and 600 miles for an oil, oil filter and air filter change, which are good compared to a competition MX bike where things are measured in hours, but still not really long enough for a committed trail rider or around the world adventurer. With a claimed 67mpg, obviously depending on the type of riding and terrain the CRF has a theoretical tank range of 110 miles thanks to its larger 7.2l fuel tank. 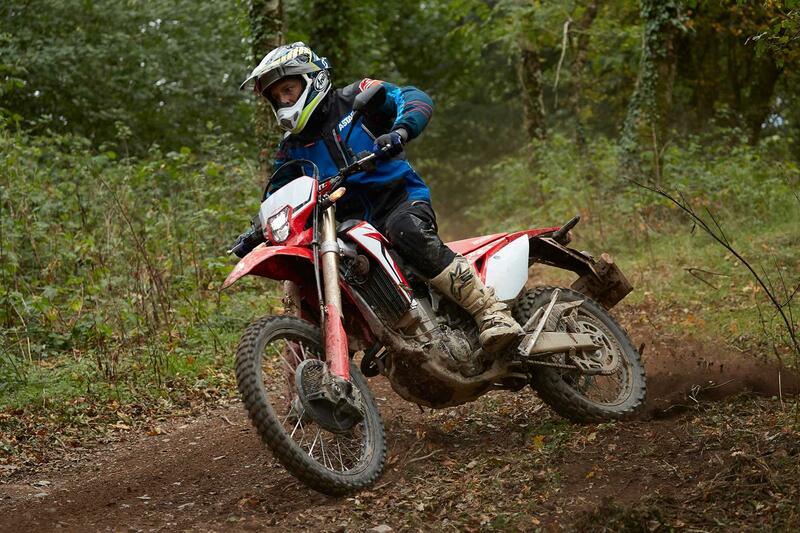 In terms of value for money, at the time of release the CRF450L was priced at £9,469 you really have to want one. In fact as a package it’s highly capable, enjoyable to ride and oozes Honda’s trademark quality. The only elephant in the room is the price. 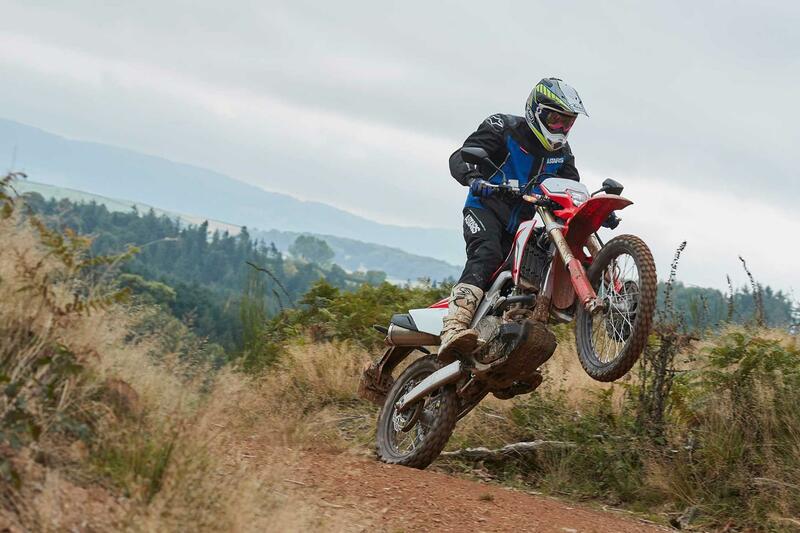 Given that the CRF450L is based on the proven MX version the spec is high with good quality fully adjustable suspension and brakes. The clear dash is concise and easy to read and the LED lights, indicators and mirrors feel part of the package – not after thoughts. The speedometer, horn, brake-light switch and mirrors all meet legal requirements. 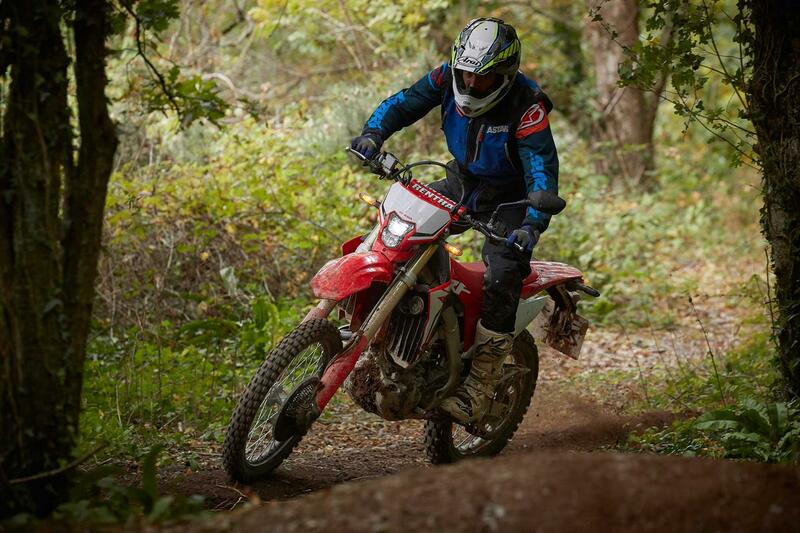 This 2019 Honda enduro bike includes the durable film-insert graphics and stream lined bodywork which comes from the new-gen CRF-R model directive. Also included in the same styling is the rear mudguard, side panels, bash plate and a larger radiator volume and electric fan are hidden by svelte side shrouds. No owners have yet reviewed the HONDA CRF450L (2019-on).